The downfall of Polis has begun when the COL recruiters (?) 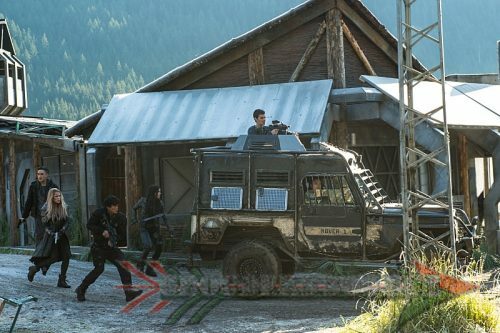 ALIE and Jaha arrive in the Grounder capital. They have taken Emori with them to derail Murphy, and to persuade Ontari. They are indeed successful at their task as they have chipped everyone. Eek! I guess the point of joining is to erase the trauma and pain that everyone has endured. It sounds like a great plan, but is worth the mind scarification? My answer, no! And, who else thought that it was disrespectful that ALIE was in Lexa’s chair? Lincoln and Sinclair had the traditional Grounder good-bye when their spirits are released by a pyre. It was comforting, knowing that everyone was there supporting one another. We have not seen a pyre since Finn, and to see it again, it was very heartfelt. Now, at least Sinclair and Lincoln no longer have to take strife and suffer. I hate to admit it, but I did get some satisfaction with Emerson’s death. This guy has been seeking revenge since the irradiation of Mt. Weather, but he does have a good reason for it. Even still, he really stepped up his vapidness and evil in Demons, by terrorizing the ‘Quents and killing one of my favorites. However, how Emerson died was a cool way to see how the AI can reject someone if they do not carry the rare Nightblood. And, the AI 2 was not at all affected after it done it. Why did Sinclair have to die? Why? I was way beyond upset because since season one, I liked him. He kept the ARK and Arkadia thriving, despite its problems, and he was patient. I especially loved the father/daughter relationship that was formulating between him and Raven. Yet, you realized that any loving relationship is precious and fragile. Count every little life blessing, as it may be taken away from you unexpectedly. Yet, Sinclair was too good and pure, and he deserved more. He was the only character, along with Wells that did not kill anyone, for survival, or otherwise. I just hope that Sinclair is really Raven’s father, as I believe that is the only thing that will ease the pain. Those were the moments of Demons! Pretty dark, right? Well, I hope that you enjoyed them. Follow Grounders Source on Twitter, and like at Facebook.com/grounderssource. You leave a comment below as well.